Want to build an active and engaged audience for your webcast? Make sure they can interact with it, in real time. Any digital marketer worth a salt understands that people no longer just consume content, they interact with it. Or, at least they want to! Incorporating tools and opportunities for potential customers to engage with your brand greatly increases the chance at making a sale or having a successful product launch. In the past, webcasting was a one way medium. Information was shared with a viewer who watched and then (hopefully) learned something. If the viewer then wished to engage further, they could contact whoever made the webcast or continue to watch future instalments. If all of the above happened, it meant the webcast could be deemed a success. The problems was, this left little place for a participant to feel involved in the process and left a lot of opportunities for a potential customer to leave the funnel before becoming a qualified lead. Today, webcasting is seen as an opportunity to create an interactive community, and by doing so, companies increase attendance, provide a more engaging “production” leaving attendees motivated and inspired, and ultimately increase their return on investment. Everyone wins. Let’s explore what a webcast is and how greater interaction can be achieved. Webinars and webcasts. They sound similar but there are some big differences. The word webinar comes from merging the words web and seminar. They have become commonly used in the marketing world as a way of generating leads and reaching out to customers—that’s why there is often a registration or opt in required. Consumers may equate them with a very long but engaging “commercial,” as the end result is often a landing page seeking a sign-up to a program or “trial.” Webinars are conducted on the internet and aimed at small groups of a few hundred. Webcasts are intended for a larger audience. 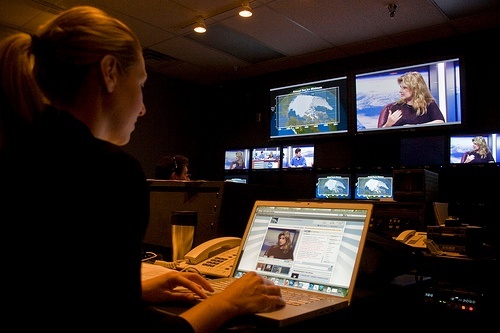 A webcast, or a web based broadcast, may be live or pre-recorded, but the expected quality is closer to a traditional broadcast. Webcasts can be audio streams, PowerPoints, or full HD, studio quality productions. You can webcast an event, a show, or an entire conference, allowing people across the globe to attend, and watch keynotes and speakers in real-time. Like a traditional broadcast, up until now there has not been as much room for interaction as companies would like. But that does not have to be the rule. Webcasters need to offer an element that will cause audiences to keep paying attention. Linking your webcast to a Facebook group is one way to encourage discussion, both before and after the webcast. Live Tweeting the webcast is another great way to provide small snippets of information to your audience and remind them of your presence (and that they are missing a great presentation if not already participating!). Don’t forget to advertise your upcoming webcast on LinkedIn as well. A live Q &A session will make your webcast seem less like it was recorded previously and give your audience a greater feeling of participation. Surveys can also bring a sense of collaboration to your audience. You can ask them to rate key terms or subject matter that the webcast focused on, even, if you are up to having a bit of fun, the background music used or the creativity of the slides seen. This allows them to inject their personality—and their preferences—into the event, while also giving some great feedback. All without having to actually be there. Take advantage of as many ways as you can to bring interaction to your webcast. Using social media is an easy and effective way to begin. Offering a live component such as Q&A or a follow-up session brings the audience closer to your company and offers more engagement. Remember, your audience is a community, and it’s up to you to continually work to bring them together. Do this, and you will see greater success with your webcasts. HB Communications has streaming solutions for all of your needs. Contact us today for more information.